Welcome to the official website of author Jeff Stone and his award-winning Five Ancestors series! Here you'll learn what Jeff is up to, plus get a better idea of what motivates him to write his books. For the latest information, check out his EVENTS page. You can also connect with him via FaceBook, Twitter, Google+ and more! Don't forget his INTERVIEWS & AWARDS & REVIEWS page. Nearly 600,000 Five Ancestors books have been sold, and they're available in 14 languages. That's a lot of choices! Browse through the BOOKS page to see print and audio editions from around the world. 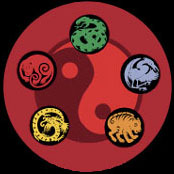 You can also get detailed information about the original Five Ancestors series, as well as the NEW modern-day, kung fu/cycling trilogy—Five Ancestors: Out of the Ashes! Read the first chapter of Book One, PHOENIX! Penguin Random House has created a fantastic Five Ancestors website that contains lots of fun things, including an activities page with five different GAMES! 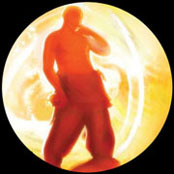 Be sure to play PHOENIX'S RIDE, the NEW game to celebrate Five Ancestors: Out of the Ashes, Book One—PHOENIX! Or take a fun quiz to determine WHO'S YOUR ANIMAL SPIRIT?! Filled with action and adventure, and seeped in Chinese culture, the Five Ancestors series is perfect for engaging young readers. Several of the books have been awarded ALA/YALSA's Quick Pick for Reluctant Young Readers, and SNAKE received the International Reading Association's Children's Choice Award. 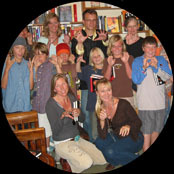 The TEACHERS page includes an Educators Guide for the entire series, as well as information about how to obtain a list of Jeff's favorite kids books. "Write what you know" is the driving force behind Jeff Stone's work. 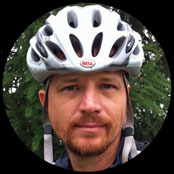 From mountain biking in Texas Hill Country while researching PHOENIX, to taking his kung fu black belt test at China's famous Shaolin Temple while writing the Five Ancestors, Jeff immerses himself in the world of his characters. His most rewarding adventure to date? Finding his birthmother while writing TIGER. Like his main Five Ancestor's characters, Jeff was an orphan. Read his BIO and RESEARCH pages to learn more. 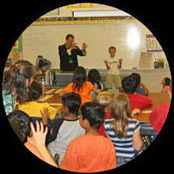 Jeff Stone has given hundreds of high-energy, interactive school presentations in several countries. 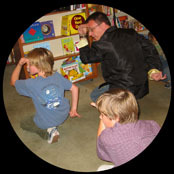 He teaches youths "animal style" kung fu poses to represent different series characters while explaining key elements of Story. He also speaks to adults at universities, writer's conferences, and educational gatherings such as the International Reading Association's Annual Conference, American Library Association's regional conferences, and state school librarian conferences. Contact us for more information.